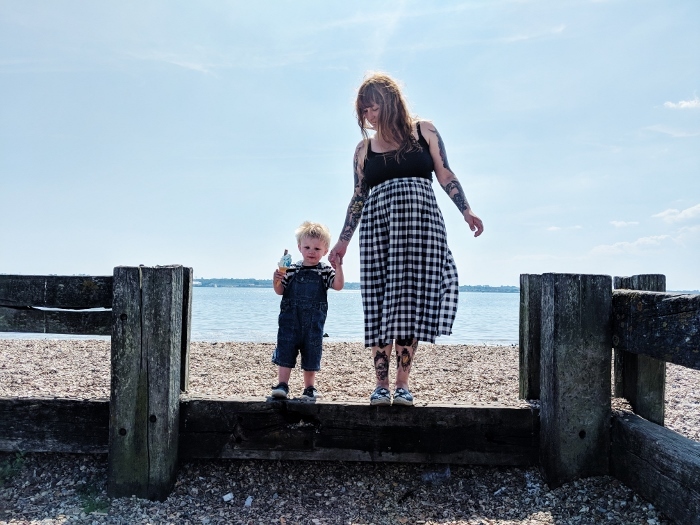 Getting out and about with two kids that are both under three, and to be frank, almost under two (Henry’s second birthday was two and a half weeks ahead of Dexter’s birth) can be a bit of a struggle. Henry is a pretty strong willed character and mightily independent which I adore, but can also be a bit tricky to navigate. And with most toddlers, sometimes there is just no reasoning with them! And to be honest, I feel like I parent a whole lot better when we’re outside and exploring. 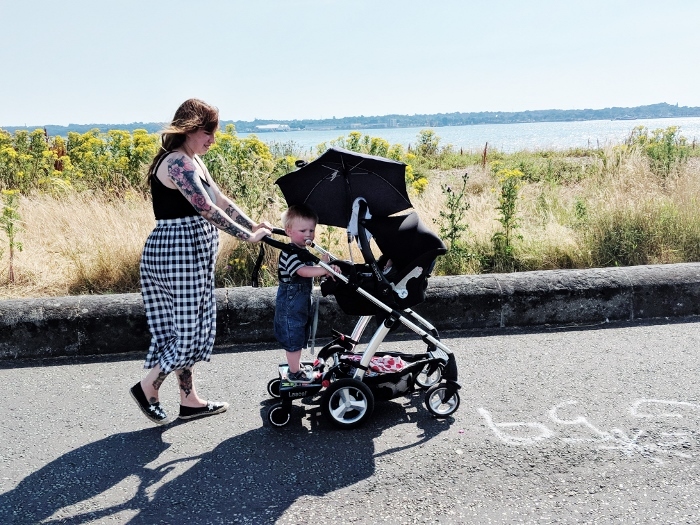 We’ve always been interested in a Buggy Board for short trips out with Henry, considering his love for running around, but also wanting to keep him safe and well actually make it to our destination sometime in that same week. And we all know that a free toddler makes any trip about 160574037 times longer and more stressful. 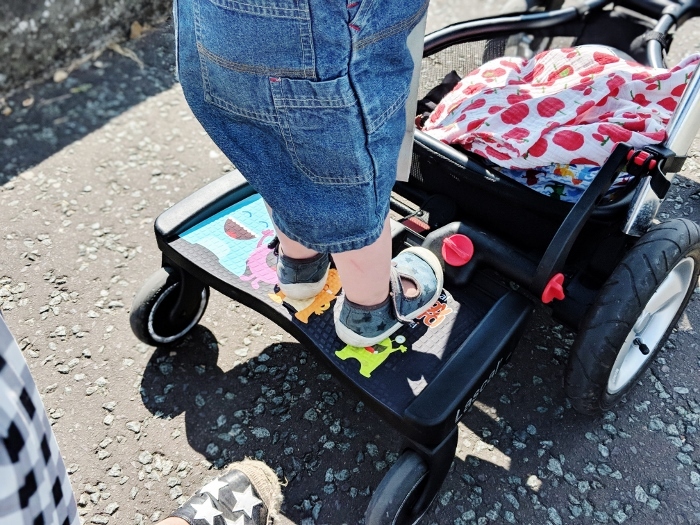 Initially we were going to have the Buggy Board on our Cosatto Stroller, but have decided this way is a better option at the moment. 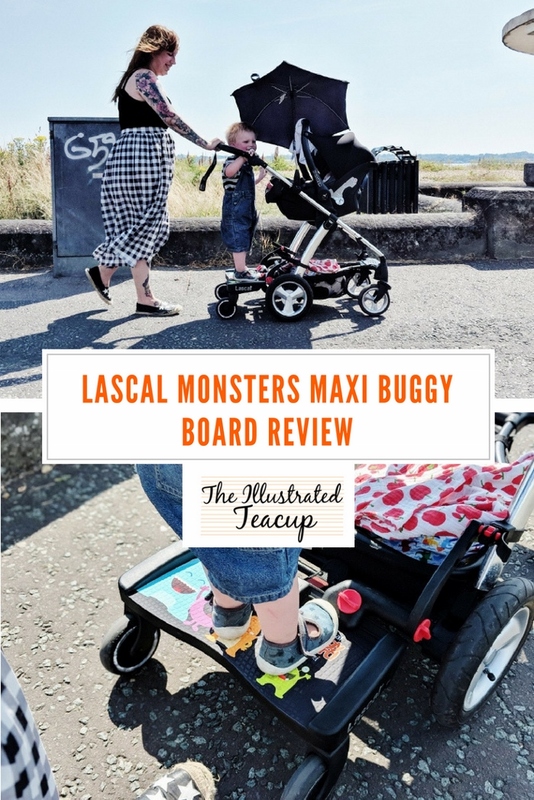 However the plus side with the MAXI Board is that it fits so many different pushchairs and strollers so you aren’t limited by its uses. Henry has taken to it really well, and loves being able to check on Dexter whilst we’re on the move. The added suspension means it is fine on most types of terrain, and when it’s not needed it can be lifted off the floor and suspended from the handle. He stays on it well, and although he has some issues with announcing that he wants to get down i.e. he just steps off, we’re really loving the freedom for us all. As for putting it together, it’s great when it’s on, (and taking the board off the chassis so we can put it down to go in the car is so so easy) but Dann did have a few choice words whilst fitting it to make sure it was level. 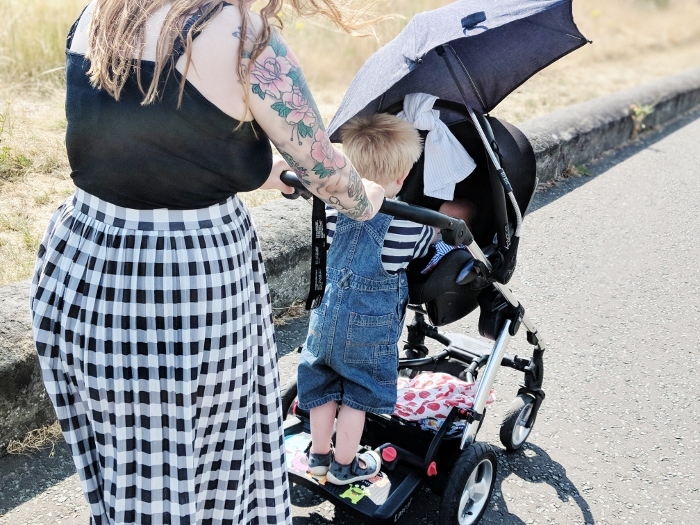 But I think that’s mostly down to him being a bit of a perfectionist, and it being designed to fit lots of different styles of pushchair. 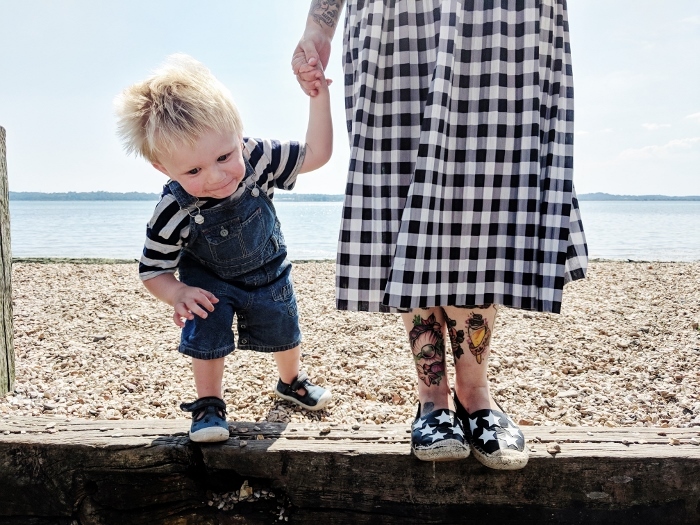 Plus you want it to be secure, so make sure you allocate a good amount of time to getting it fitted, and definitely don’t attempt with a toddler around. 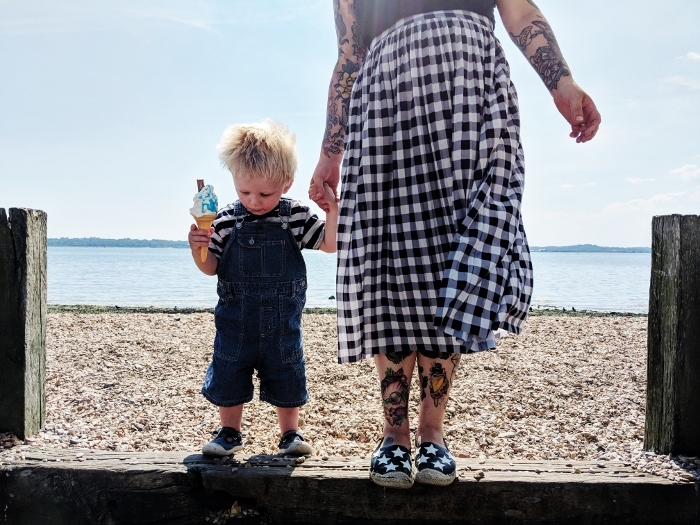 To celebrate our first outing with our Buggy Board and treat Dann for a slightly stressful construction, we got ice cream at the beach. And I don’t think you can beat a day of exploring and ice cream in my books. *product sent as a PR sample in exchange for review on this site. All opinions, as always, are my own and not influenced by the brand. For more information, see my Disclaimer page. I does make life so much easier, especially for short, quick trips! Yes it should do. 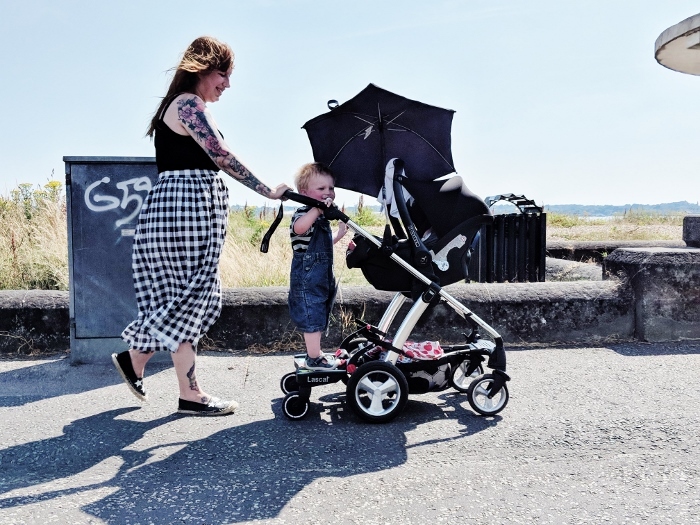 It fits our Mama's and Papas, Icandy and Cosatto pushchairs!